Last Weeks Amazing Race Premiere had everyone wondering will Brenchel survive this type of “real” reality TV Show. They did survive the first leg of the race and did quite well coming in second place. TAR20 contestants Joey Fitness and Danny showing off their abs to the TMZ cameras. Rachel Reilly Drunk as f*ck comes into the shot spewing out that these guys should eat some cheeseburgers. Brendon starts eyeing Danny’s abs and decides to rub his shirt on them. My whole family has gone to school with Brendon at UCLA. My sister graduated is 2006, I graduated in 2009 and my other sister graduated in 2011. It is fantastic to see Brendon take his education seriously. Now he is going around the world to find a cure for cancer. Bravo Brendon, but please don’t wear any UCLA shirts. On a side note, did Boy George Rachel actually say, “congratulations” to Good looking Rachel and Dave for winning the leg? Good to hear some people take their college serious, but maybe not trying to cure cancer will lead to a break through. Just refer to it as Boy George that is the name that fits it best, you aren’t sure if it’s male or female just like Brendon likes it. From what I hear about you Anonymous, isn’t a lot more HOW YOU LIKE IT, since you are becoming a very well know DYKE and lesbo lover to Name! Good one, you sure told them. What are you, 12 years old? Sadly he is a grown man but that is the average age of those he dates, any older and he can’t hold a conversation with them. OH YEAH!!! START WINNING AND BEAT OTHER TEAMS! TEAM BRENCHEL! PLEASE TEAM BRENCHEL CRUSH OTHER TEAMS! NO MORE REALITY STARS CURSE! 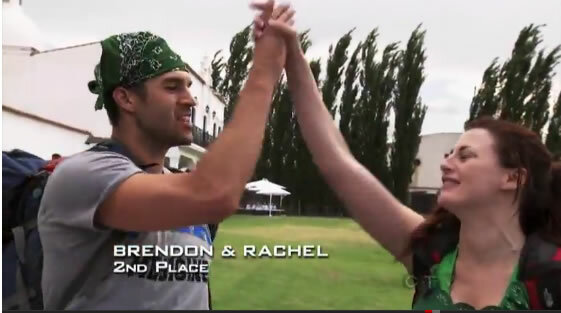 Yaaa Team Brenchel! Beat the other teams like you beat Team Jeff and Jordan in Big Brother 13! Did you mean Yaaa team Grodner? Without her NONE of those four make it to final three. And of course there would be no Frankie goes to hollywood Granda Jr. Addition through subtraction. He might be one in the same both have a thing for men. Squabble should know all about it, since she’s a well known lesbian throughout all of Utah and has had ‘a thing’ for the other psycho female poster here called ‘Name’. The two are always defending each other in issues regarding vulgarity, and their mutual desire for it. Ewwwww! Actually we can all read and that was clearly not what they said. It’s sad that you are such a one trick pony that regurgitating and putting your stalker spin on it is what you are reduced to in these forums. If you got nothing original to say, don’t say anything. Porsche Briggs is in the 2012 Sports Illustrated Swimsuit Issue!